Windows 10 includes a hidden built-in administrator account. Here’s how to enable it or disable it. Windows 10 includes a hidden Administrator account you can use to manage all the resources of the computer. In previous versions of Windows, such as Windows XP, this account was readily available when you set up your computer for the first time. Starting with Windows Vista, the built-in administrator account is disabled by default. 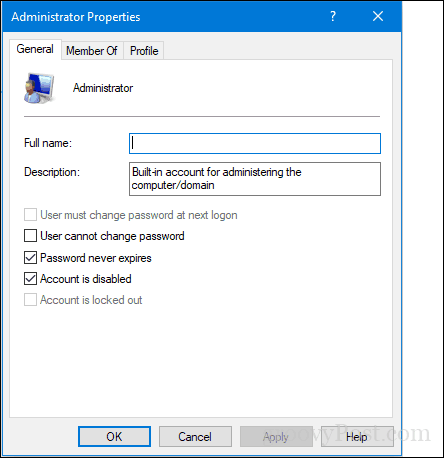 In this article, we’ll take a look at how you can enable this built-in administrator account in Windows 10 and why you may or may not want to. There are two ways to enable the built-in administrator account. The easiest method is from within Computer Management. Note: Computer Management is only available in Windows 10 Pro. Use the Command Prompt instructions below for Windows 10 Home. Right-click the Start menu (or press Windows key + X) > Computer Management, then expand Local Users and Groups > Users. Select the Administrator account, right click on it then click Properties. Uncheck Account is disabled, click Apply then OK. The command line can also be used to enable and disable the administrator account. Open Start, type: CMD, right-click Command Prompt then click Run as administrator. What’s the Built-in Administrator Account for? Explaining how to enable the built-in administrator account in Windows 10 is a lot easier than explaining why you would want to. Simply put, unless you know why you want to use the built-in administrator account, you probably don’t need it. In fact, you should probably leave it disabled—the built-in administrator account has free rein across your entire system which makes it a security vulnerability. But more to the point, there’s practically nothing that the built-in administrator account can do that a standard Windows 10 administrator account can’t do. When you first set up and configure Windows 10, the first account you create will be an administrator account. If you’ve accidentally demoted, locked out, or forgotten the password to your administrator account, using the built-in administrator account may be your saving grace, but only if you’ve already enabled it beforehand since you need administrative privileges to enable or disable it. If that’s the purpose you’re using it for, you’re still better off creating a separate standard administrator account, rather than using the widely-known and abused built-in administrator account. So, why does the built-in administrator account exist in the first place? It’s mostly for OEM system builders, who may want to make tweaks to the system before the out-of-box-experience is complete. If that’s not you, then you’ll be hard-pressed to find a reason to ever use the built-in administrator account. Computer Management is not available in Windows 10 Home, so you’ll have to use the command prompt instructions.